On a January afternoon in 1893, men hunkered down behind sandbagged emplacements in the streets of Honolulu, with rifles, machine guns, and cannon ready to open fire. Troops and police loyal to the queen of the sovereign nation of Hawaii faced off against a small number of rebel Honolulu businessmen—American, British, German, and Australian. In between them stood hundreds of heavily armed United States sailors and marines. Just after 2:00 p.m., the first shot was fired, and a military coup began. 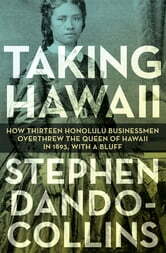 This is the true, tragic, and at times amazing story of the 1893 overthrow of Queen Liliuokalani of Hawaii and her government. It’s also the story of a five-year police state regime in Hawaii following the overthrow, an attempted counter-coup by Hawaiians in 1895, and of how Hawaii became a United States possession. 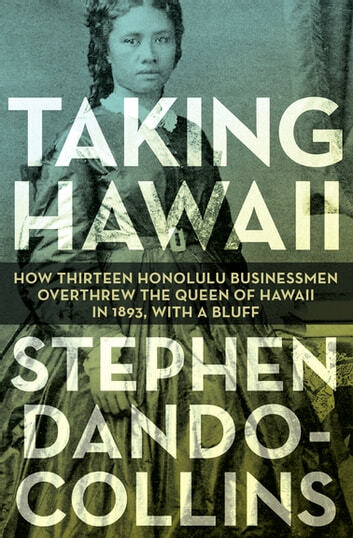 In Taking Hawaii, award-winning author Stephen Dando-Collins (Standing Bear Is a Person, Legions of Rome, Tycoon’s War) reveals previously little-known facts uncovered during years of research on several continents, in the most dramatic and comprehensive chronicle of the end of Hawaii’s monarchy ever published. Using scores of firsthand accounts, this often minute-by-minute narrative also shows for the first time how the queen’s overthrow teetered on a knife’s edge, only to come about purely through bluff. Taking Hawaii reads like an exciting novel, yet this tale of a grab for power, of misjudgment and injustice, truly took place. Judge for yourself whether you think the queen of Hawaii was wronged, or was wrong. Well researched telling of a sad tale. I can understand how the native Hawaiian decendants resent the haoule.